Welcome to our March episode with this month's guest, writer/podcaster Tai Gooden! Tai stopped by to talk about how her early fandom started with her family, how she and her best friend started their own podcast, and of course, how she fell in love with Doctor Who. After that, Tai drops her pick of the month - the mid-60s offbeat sitcom, The Addams Family! Join us as we reminisce about oddest family of 60s television and how well the show may do if it were brought back today. Thanks for listening! After a very busy February, we are back with a very late episode, but we promise that it's well worth the wait. Joining us this month is the award-winning writer/actress of stage and screen and the Fourth Doctor's brand new companion at Big Finish, the wonderful Jane Slavin! Jane stops in to share her beginnings as a writer, her acting career, and her long history in radio drama including her new run as WPC Ann Kelso alongside Tom Baker's Fourth Doctor. Then Jane brings along her Pick of the Month, David Nobbs's comedy classic sitcom from the late 70s, The Fall & Rise of Reginald Perrin. We'll discuss the story of a man that is never satisfied with his life to the point of faking his death not once, but several times, starring one of Jane's favorites, Leonard Rossiter. Also, James & Ian stop by to review the recent screening of Logopolis to celebrate the upcoming Tom Baker Season 18 blu-ray set. Welcome to our third year of Who & Company and we're starting out in a very fun way as we welcome the host of various podcasts such as The 4 Who Rule: A Seinfeld Podcast, The Birds of Prey, and Straight Outta Gallifrey, Ashford Wright! Ashford stops by to discuss how he discovered his love of podcasting and his very first viewing of Doctor Who. Then he takes us back to the mid-90s for that ABC TGIF classic sitcom, Boy Meets World! Come reminisce with us as we cut class with Cory & Shawn and try not to run into Mr. Feeny. And watch for Ashford's YouTube series, Nerd News Now! On this very special edition of Who & Company, it's time for our annual Doctor Who Special review and once again we're joined by James and Michele from THE Doctor Who Podcast. This time they've brought along another alumni from the show, Stephen! Join us as we talk about the New Year's Doctor Who Special, Resolution. Were we all surprised by the return appearance of an old foe? Then we cast a broader net and discuss Series 11 as a whole. How did Chris Chibnall fair in his first year? Was it an outstanding season or did it just tick a few boxes? Add to that a first-time interview with Stephen Prescott and there's your annual special. Thank YOU so much for taking the time to download and listen to our show and we hope you'll join us later in January as we kick of Season 3 of Who & Company! Merry Christmas and Happy Holidays to all of you and welcome to our December episode! This month, we have another member of Radio Free Skaro joining us - Warren Frey! We'll talk with Warren about how a work-related friendship turned into 12 years of podcasting, an update of the recently completed Series 11, and his online project, Bookshelf Doctors. Then we enter those smoke-filled corridors of bureaucracy and veiled insults as we look at the 1978-1980 spy series, The Sandbaggers and why it's one of Warren's favorite classic shows. James, Ian, and Adam also drop in to report on the current state of fandom in the UK following the end of Series 11 and a small tease for our next episode. See you in the new year! This month, award-winning writer John Dorney joins us to talk about his beginnings as a writer, penning many fan favorites at Big Finish, and how some of those ideas came to life. Then we'll have a round table discussion on Series 11 thus far on Doctor Who and what we all think of the first 6 episodes. After that, John brings along one of his all-time classic shows, Columbo, as our classic show of the month. We'll discuss not only the fantastic acting talents of Peter Falk, Donald Pleasance, and William Shatner, but also what a unique spin the show put on mystery television in general and how Columbo is very similar to a certain Doctor. But....just one more thing... James & Adam had a visit to the BFI screening of Earthshock with Matthew Waterhouse and Eric Saward in attendance promoting the upcoming Peter Davison blu-ray box set. And you'll hear all about it on this episode of Who & Company! Happy Halloween! 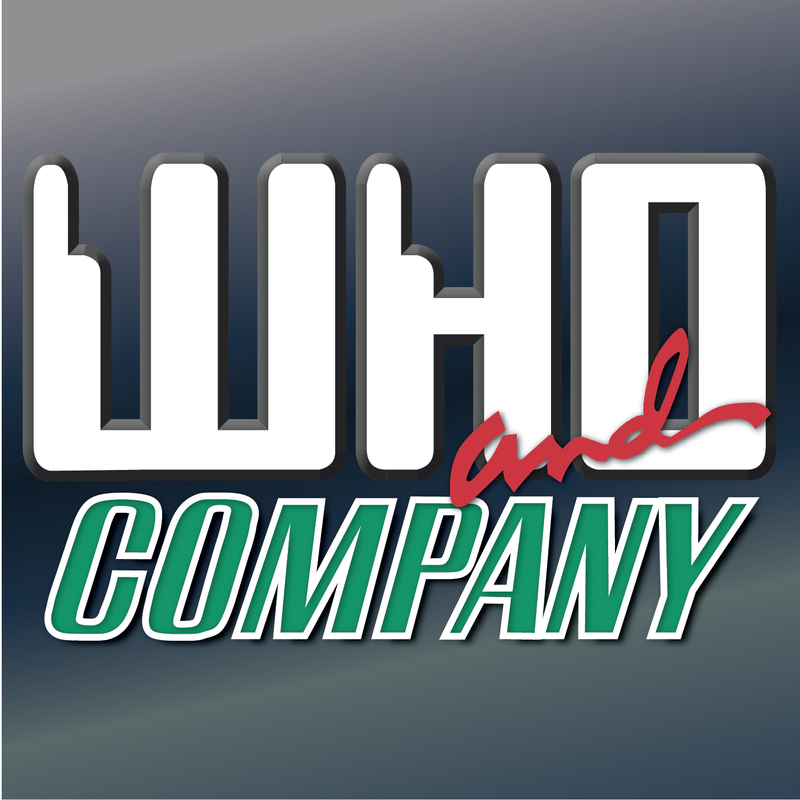 Welcome to the October edition of Who & Company! This month, our featured guests are from the creative world of PixelWho, Nathan Skreslet & Ly Cao. They talk about how their business got off the ground several years ago, what it's like to pixelate your favorite Timelord, and their perspective on the first three episodes of Doctor Who Series 11. Only three days late for our September episode, but it's well worth the wait as we welcome Doctor Puppet's Alisa Stern to the show discussing her love of Doctor Who, the world of puppetry, and what it takes to make an 8 part story that's spanned 5 years. And then it's on to one of Alisa's other favorite shows, Avatar: The Last Airbender! We'll talk about Nickelodeon's animated epic, why we all love it, the upcoming Netflix live-action series, and......the movie that doesn't exist...shhh. Our UK team (James & special guest Adam J. Purcell of Staggering Stories) also has the latest news and a special report on the recent Whooverville convention in Derby! Before our regular September episode later this month, we thought we'd surprise you with this Special Edition of the podcast with a reunion you thought you'd never hear. It's a roundup of Doctor Who news with none other than UK team member, James Rockliffe, joined by former DWP co-host, Trevor Gensch! Fans of THE Doctor Who Podcast will remember the broad spectrum of voices and opinions of the various hosts and this special episode doesn't disappoint. We hope you enjoy and as always, "you are most welcome". Join us again later in September! This Week in Time Travel's Alyssa Franke joins us this month to discuss podcasting, blogging, and writing her own entry into the Black Archives about Hell Bent! After that, Alyssa chooses the Netflix series Sense8 as her pick of the month. We talk about how important it is for the positive portrayal of different cultures on television and how it stirred a massive following into lobbying for a proper finale. And did we mention Doctor Who stars and references in Sense8? Also, keep an eye out in early September when our UK team has a special of their own covering the latest news and topics. Were you a fan of THE Doctor Who Podcast? Well, you don't want to miss this! Is this a dagger which I see before me? No! It's the July edition of Who & Company all about education and Shakespeare! Join us in welcoming our special guest this month, podcaster Erik Stadnik! He is co-host of Doctor Who: The Writer's Room and The Classic Horror Cast and he sits down with us on this episode to discuss Doctor Who, of course, but also one of his other favorite shows, the classic Canadian show about the trials and tribulations of running a small town Shakespeare theatre - Slings & Arrows. Before that, we have our UK team, James & Ian (formerly of THE Doctor Who Podcast) with a report of the new Tom Baker blu-ray set and the recent Genesis of the Daleks BFI screening. None other than Staggering Stories' own Adam J. Purcell joins them, so don't miss it! And a great big welcome to all of the new listeners we met this past weekend at Raleigh Supercon! We hope you enjoy the show. Here is our June episode just in time before the end of the month! And speaking of time, our guest this month is no stranger to time travel. In fact, he travels in space as well as time. He's the star of the Inspector Chronicles and former Inspector Spacetime on NBC's Community, it's Travis Richey! He stops by to discuss his latest projects, his recent birthday wish of jumping out of an airplane, being eaten by a Dinocroc while David Carradine was living it up in Hawaii, and of course, Doctor Who. He also chooses a fantastic reboot of a 70s sci-fi classic, Battlestar Galactica, to chat with us about. If that's not enough, he's also created the Travis Richey Sketch Show on YouTube. Listen out for a sketch after the credits. Also, joining us from London are James & Ian with the latest news about Twitch, Doctor Who's new composer, and football results. Just in the nick of time here's your May episode! This month features the winner of the Who Against Guns drawing to be a guest on our show. It's game designer and Doctor Who fan, Steven Marsh! Join us as we discuss our favorite show and the classic series he's chosen to geek out over...Mystery Science Theater 3000. But before that, we are joined by Blue Box Alliance founder Jeremy Wheeler to discuss how his organization is using Doctor Who to teach kids (and adults) how to deal with bullying and their efforts to complete an upcoming fan film! We're also joined by our UK team, James & Ian, who report on the current state of Doctor Who fandom in the United Kingdom. We hope you enjoy this jam-packed episode and we'll see you next month! May 2018 is so packed here at Who & Company that we've created an entire extra bonus episode for you just to fit it all in. This special episode includes an interview with the late comedian/magician/actor Harry Anderson talking with Drew a few years ago just as one Peter Capaldi was taking over the role of the Doctor. Hear Harry talk about one of his favorite shows, Doctor Who! Next up, Drew talks all about his recent jam-packed Saturday at WHOLanta 2018 in Georgia with Louise Jameson (among others) and the launch of Children of Time, the fan-written charity book featuring companion essays by WHOLanta organizer, Alan Siler, and our own Drew Meyer! See you in a few days with our feature length May episode! This month, we look back at our time at this year's (Re)Generation Who 4 convention in Baltimore, Maryland featuring many guests including Peter Davison, Colin Baker, and the first public appearance of Peter Capaldi since leaving the role of the Doctor! And if that's not exciting enough, we were very fortunate to grab a 10 minute interview with none other than Ian Chesterton himself, William Russell, discussing his time on The Adventures of Sir Lancelot! After that, you can hear our live panel with comic artist Simon Fraser discussing what it's like to draw the Eleventh Doctor and why he chose Star Trek: Enterprise as his classic TV show. All that and a recap from us of this year's fantastic convention. Join us this month as we present a special episode focusing on a very important fundraiser, Who Against Guns. We talk with organizers Joy Piedmont & Graeme Burk about the campaign, how it's progressed so far, and how they got Steven Moffat and Philip Hinchcliffe on board. We'll also discuss their love of Doctor Who and hosting their own show, Reality Bomb! See you at ReGeneration Who, March 23-25, 2018 in Baltimore! February is the month of hearts and flowers, but this month it may mean hearts being ripped out of chests and flowers on graves. Why? Because this month we're talking about zombies with our featured guest, Nicole Mazza of Terminus: A Doctor Who Podcast! Nicole shares her love of Doctor Who, writing fanfic, and choosing this month's classic show, BBC3's In The Flesh. This month also sees two new members joining the Who & Company team! James and Ian, formerly of THE Doctor Who Podcast, now form our UK team and report from the recent BFI screening of Day of the Doctor with special guests Steven Moffat and Marcus Hearn in attendance. Thanks for joining us. See you next month! Thank you so much for a very fun and successful first year of Who & Company. We're starting out Year Two in a big way! Joining us for our January episode is none other than former Doctor Who Brand Manager, Edward Russell! We'll talk about his time on Doctor Who and also his thoughts on being a lifelong fan. Then Edward chooses Top of the Pops as his Classic Show, which just happens to be another program on which he's worked. So sit and back and listen to tales about behind the scenes, lip-synching, embarrassing live performances, and future plans for this month's guest, Edward Russell! Then, as an added bonus, we check back in with podcaster Eric Molinsky and find out how his newfound fandom with the show is coming along as he and Drew discuss Twice Upon a Time. Welcome to 2018 and thank you so much for listening and supporting our show throughout its first year! As a special thank you, we thought we'd bring back our very first two guests, James & Michele from THE Doctor Who Podcast to discuss not only the Christmas Special, but also the recently released brand-new definitive version of Shada, featuring Tom Baker's Fourth Doctor & Lalla Ward's Romana. So sit back and enjoy this ALL Doctor Who special edition of Who & Company! ...and SPOILERS abound for Twice Upon a Time AND Shada! Please watch them before listening and we will see you later this month for our January episode. As we close out our very first year of the show, we are pleased to have with us fellow podcaster and brand new Doctor Who fan, Eric Molinsky of the Imaginary Worlds podcast. We chronicle his journey from barely having seen and episode of Doctor Who to becoming a huge fan - and you won't believe how far he's progressed since he started! Then we switch over to one of Eric's favorite shows, the recent J.J. Abrams television sci-fi series, Fringe - a show all about multiple universes and sometimes diabolical experiments. And we round out the interview turning our focus back to Doctor Who. Happy Holidays, Merry Christmas, and Happy New Year to you all! Please join us for another year in January and maybe even a Christmas surprise coming very soon. Thanks for listening! With our apologies for being a week late, we present to you our celebration of the recent 54th anniversary of our favorite show with a plethora of interviews from this year's Long Island Who 5 Convention in New York brought to you by our own Drew Meyer! Join us for interviews with such Doctor Who luminaries as Sylvester McCoy, John Leeson, Waris Hussein, Edward Russell, Barnaby Edwards, Richard Ashton, and the lovely Katy Manning. But before that, Brent & Drew finally meet in person and interview the organizers of The Raleigh/Durham Doctor Who Meetup Group, Amy Deletrre and Brad Gillespie, as we all gather together for dinner and the top three club-voted Peter Capaldi episodes in honor of the outgoing Doctor. See you later in December! It's our first foray into the world of animation as Christopher Burgess of Radio Free Skaro and Katrina Griffiths of Start the Music and Verity! both join us to talk a little Doctor Who and then delve into the strange and wildly popular world of Rick & Morty! As always, spoilers for Rick & Morty are in this episode, so if you've never seen it, do yourself a favor and go watch it THEN come back and listen, won't you? Although we're still a month away from Halloween, we thought we'd get a jump start from horror enthusiast and podcaster, Paul Heath as our guest this month. You may know him from the Hammered Horror podcast or as one of the members of the Pharos Project podcast, but in this episode, he's brought with him that very influential reporter of the supernatural, Kolchak: The Night Stalker! Is he the world's greatest reporter or is he just making it up as he's going along? Come join us! We had a lot of fun recording this one. NPR's Petra Mayer is this month's special guest kindly joining us to discuss our thoughts on the recently completed Series 10 of Doctor Who, the casting of Jodie Whittaker, and her favorite show pick of the month, The Great British Bake-Off.....or The Great British Baking Show, depending on which country you're actually watching it in. Will Paul Hollywood give the stare-down? Will Sue be the 14th Doctor? Will Mary fall over drunk? Listen in! Join us for our July edition as we are spending some time with long-time podcasters and married couple, Dave & Elizabeth Keep of Professor Dave's Ark in Space, or PDAIS for short. We talk about Series 10 of Doctor Who up through Episode 10 and then take a trip down recent memory lane as we reminisce about the American cult classic from 2002, Firefly and its follow-up feature film, Serenity. Thanks for listening and please rate us on iTunes! Yes, you read that correctly. Writer Jamie Mathieson is here with us for the June episode of Who & Company! We discuss the early beginnings of his writing career, his feature film, and of course, his writing for some of the best Doctor Who stories in recent years. Then we talk about a sci-fi classic that Jamie himself chose for us, Sapphire & Steel! So join us as we spend time with Jamie Mathieson.....including that silly outtake after the credits. This month, we are joined by actor Jeremy Radick who played Gareth the Security Guard in the Doctor Who 1996 TV Movie with Paul McGann. Jeremy has performed on many other shows including Psych, The Odyssey, and The X-Files. We discuss his acting career and hear behind the scenes stories of his experiences with Doctor Who, Ryan Reynolds, and a very funny moment on the X-Files. We also catch up on Series 10 of Doctor Who and spend some time on the series that Jeremy has chosen for us this month - the 1967 sci-fi classic, The Prisoner! After an amazing first episode of Series 10, we sit down the very next day to discuss all of the ins and outs of the Doctor Who Convention circuit with Alan Siler of WHOlanta, Ken Deep of L.I. Who, and Taylor Deatherage of Chicago TARDIS! Our guests share their experiences attending and organizing several Doctor Who conventions, including their own, and how the joy of presenting them far outweigh the challenges. After that, join us as we rattle on about this week's fantastic Series 10 opener featuring a couple of great new companions. Thanks for listening! Join us along with one of our podcasting heroes this month as we tackle The Tripods and Star Cops with the one and only Steven Schapansky. Of course we mention Doctor Who, but we discuss so much more than that on this episode. Hear us talk about two British sci-fi gems of the 80s, drumming, and some things we've learned from Doctor Who. For our February episode, we feature an interview with a fantastic writer who's written for both the classic series and for Big Finish, Andrew Smith! We discuss many of his works at Big Finish, talk about what's coming up for Andrew, and give our thoughts on his choice for a favorite TV show to discuss this month, Survivors (the original 70s series). If you'd like to watch a few episodes before listening to our discussion, look for The Fourth Horseman and Law and Order. Both of these Survivors episodes are available on YouTube as well as DVD outlets online. ....and here we go! Thanks for joining us for the very first full episode of Who and Company, exploring Doctor Who and all sorts of related British shows with a company of great people. We're starting us off this monthly podcast with a long-awaited reunion of THE Doctor Who Podcast alumni, Michele and James! Join us for our discussion of the recently released Power of the Daleks. Stay tuned after the discussion for Drew's very special interview with the one and only Polly, Anneke Wills! Just before we release Episode 1 (and it's a big one), we thought you'd like to get to know us a bit before we get started. Glad to have you with us as we start this new podcast! Join us for Episode 1 in late January 2017!